Today’s Home Office stories include the ongoing debate on cannabis legalisation and the nationalities of those contacting the Windrush hotline. There is widespread coverage of the ongoing debate on the legal status of cannabis. The Telegraph, Mail and Guardian lead on former Conservative leader Lord Hague’s calls for a Home Office review into recreational cannabis legislation. Lord Hague claimed on Tuesday that the war on the class B drug had been 'comprehensively and irreversibly lost'. However, the papers note that the NHS and the Home Office have both rejected calls to legalise cannabis, warning that doing so would "introduce new risks for young people". NHS CEO, Simon Stevens, highlighted the serious health dangers, such as addiction and psychosis. On the subject of medicinal cannabis, the Times notes that a coalition of world-leading clinicians and academics are urging the Government to legalise medical marijuana. In a letter to The Times, 20 professors and doctors call for GPs to be allowed to prescribe cannabis. They say that this would advance research into a "wide range of potentially debilitating and life-threatening disorders". Cases like Billy Caldwell’s, Alfie Dingley’s, and others like it, have shown that we need to look more closely at the use of cannabis based medicine in healthcare in the UK. The position we find ourselves in currently is not satisfactory. It’s not satisfactory for the parents, it’s not satisfactory for the doctors, and it’s not satisfactory for me. I have now come to the conclusion that this is the right time to review the scheduling of cannabis. The Government has no intention of reviewing the classification of cannabis and it will remain a class B drug. Classification is completely separate to scheduling regulations. Any debate within government about the efficacy and therapeutic use of cannabis based medicines emphatically does not extend to any review regarding the classification of cannabis and the penalties for the illicit possession, cultivation and trafficking of cannabis will remain the same. The Independent claims the Home Office is covering up the true scale of the Windrush scandal after reports that individuals from non-Caribbean countries had also been affected. The story is a follow-up on the outlet’s report from yesterday in which they said dozens of people born in India, Pakistan and Ghana had been referred to the Windrush taskforce. The online copy carries a Home Office statement clarifying that we have always been clear that the taskforce is there to help people of any nationality who settled in the UK lawfully before 1988. The Home Office has published guidance which makes it clear that the dedicated taskforce will help anyone, of any nationality, who was lawfully settled in the UK before 1988 to get the documentation they need to demonstrate their existing right to be here. The Home Secretary has also confirmed that Commonwealth nationals who arrived before 1973 and children who joined them before they turned 18 will be able to apply for citizenship for free. The vast majority of referrals to the taskforce have been people originally from the Caribbean. 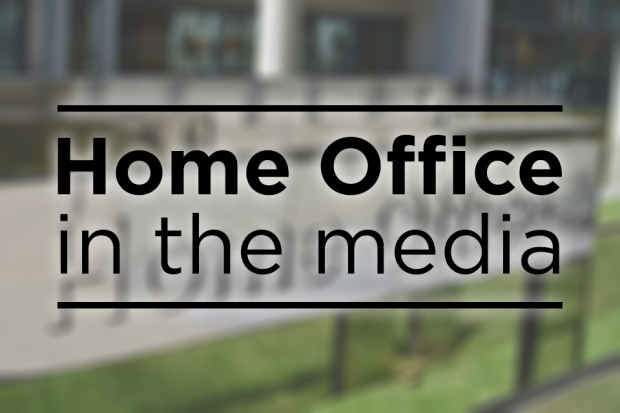 Home Office in the media is the Home Office's blog on the latest topical home affairs issues. It features a review of leading media stories, responses to breaking news, rebuttal to inaccurate reports, and ministerial comment. Find out more about the blog.